Neti has opened a door into a whole new dementia. He does not align himself with any modern art movement, though he has been widely hailed as one of America’s great under-achieving, over-employed surrealist, fantasy, sci-fi, dichotomentalist, post non-traditionalists. He holds a black belt in dichotomology. The Netizens who “people” his work are based on beings he has encountered in his extensive travels through the vast abyss between his ears and are not conjured through any external chemical means. There has been speculation, however, regarding the nature of the unique electro-chemical “imbalance” resulting in his spontaneous hallucinations, which he has diligently copied exactly as they appear to him in his mind, which he is rumored to have lost somewhere back in the latter part of the previous century. Neti was not educated in a accredited art school, though he is entirely certifiable, somehow innately possessing the secret knowledge of processes concocted over the last 500 years by lessor known artists and perfected by Elephants in India. 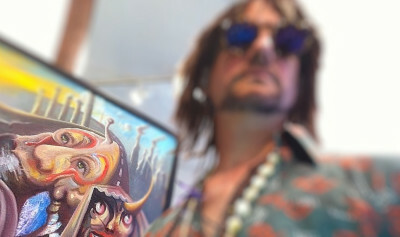 The acquisition of his considerable prowess has not been attributed to the process of Osmosis, though he has often been cited as the “Mosis of the Fine Art World,” partly because of his ability to conjure serpents from simple sticks of wood with hair on one end, and partly because of his being entirely unqualified to speak on God’s behalf. Neti sightings are extremely rare. Who knows, you might get lucky. You may even be seen with Neti. NETI is an exploration of the artists internal conflict with his identity, therefore, he is the ultimate existentialist artist, exploing our idea of what is real. Note: the phone number at the end of the film above is intentionally incorrect, to give false hope to those who may have an interest in “friending” NETI. For more information, contact his doppelganger. TransNETIfication – Netify your tired paintings!